And keep my thanks within? And none will be the same. And thank You for Thy love? Giving thanks to Thee, oh Lord? For Thy gift of life today? And thank Thee now, O God! When birds began to sing. That I may see no more. In Jesus holy name. Amen. Dear Heavenly Father, thank You for Thy mercies You shower upon each of us every morning and all throughout the day, though we so often miss them as we go about our hours focusing more on trying to complete our tasks in a race to get to the next one. Please forgive us for so often taking this beautiful gift of life you gave us and Thy wondrous treasures for granted. May You help us to take a moment to pause, to look up, and say thank You for some blessing You gave us today. May You help us to thank You for someone You have brought into our lives who is precious to us. May You help us to take a moment to whisper a prayer of gratitude, peace, love, and mercy for that soul. May You help us take the time to say thank You for my life, Lord, I love You, in Jesus’ name, amen. Angel Song © 2019 SD Harden All Rights Reserved. The Lord led me to call the new album of songs He inspired after this famous verse back in December when I’d originally planned to publish it. The night before I had a dream that sent me to my knees for more guidance. Indeed, though everything was finished and ready, the Lord wanted me to wait to publish that album. He would let me know when it was time. I have learned in my walk with the Lord to listen to His Holy Spirit and wait on His perfect timing~ even if it does not make sense. The Lord has led me to create other albums of beautiful music and then asked me to set them aside for a future date. He expects that I will obey Him without needing to know why. But how do I know it’s God and not me? That is a very good question! Our walk with Christ is a training ground in walking humbly with the Lord and living by faith and obedience to His Holy Spirit’s guidance within us. We will stumble and fall many times because we are human. I have missed the Lord very often because of more faults in me than the hairs on my head! The wonder is that He still chooses to use someone so broken and inept at trying to accomplish what He’s given me to do. The Lord does not expect perfection from His children. He only asks that we trust and obey Him. Not one of us is perfect nor will we ever be this side of Heaven. God has no perfect children. Only His Son Jesus Christ was perfect and He died to save us from our sins, and that we might be forgiven when we stumble. God knew we would not be able to do everything He wanted us to perfectly. He forgives our mistakes. He asks us to please get up again and be about His work. Don’t let failures make you quit. Don’t let others make you quit either. Don’t let persecution or sickness or pain or troubles or anything in this world keep you from doing what God has asked you to do for His glory. Right after my dream in December that warned me not to publish my album, I suffered a severe life threatening illness. How grateful I was to the Holy Spirit for His guidance! Today I’m so thankful to be alive and praising my beautiful Lord and Savior Jesus Christ for His mercy and grace towards me, a sinner He saved through His death on the cross. I praise my Holy Abba Father for raising His Son Jesus Christ from the dead to redeem my soul and give me the righteousness of Christ. I’m made right in His eyes by the spotless blood of Jesus! He forgives me for all my sins as far as the east is from the west, and He expects that I will forgive others just as He has forgiven me. The Lord Jesus Christ died to save every person who had ever lived or would live because of God’s measureless love for every soul He created. May our Heavenly Father bless and encourage all who read this message today and fill each soul with His peace that passes all understanding and an abiding assurance of His measureless love for each one of them, in Jesus’ name amen. *To preview the songs on my new Instrumental Album, “To Everything A Season,” Follow the link below to my HearNow Music Preview Website where you can listen to audio clips from each of the Album’s 17 Tracks. You will also find links to Spotify, Amazon, ITunes and other streaming services, as well as to cdbaby, where you should be able to stream the full version of all my songs any time. To Everything A Season © 2019 Suzanne Davis Harden All rights reserved. May God be Glorified! Scripture Collage Design by SD Harden ~All Glory To God! I want to thank all of you who have been praying for me during the past several months. You can’t imagine how much your prayers have meant to me during my recent illness. The Lord knows who you are and I pray that He will give you a crown of glory someday for your faithful intercession. “A lot of both!” I told him. This medical professional witnessed your faithfulness in prayer and gave glory to God! I want you to know that your lives are beautiful blessings to me, to the Lord Jesus Christ, and to all whose lives you touch each day. May you know that you have continued to be in my prayers daily. Even though I have not been able to post or visit you for many months now, you have always been in my heart. The song is about what the Word Of God promises. A platitude is a beautiful, usually moral statement, that has been quoted so often it has lost its meaning. How could I tell this person that the promises in the Bible were not platitudes~that all of the promises of God in Christ Jesus were true. I believed this because the Bible said so and I had experienced God’s faithfulness to His Word many times throughout my life. Yet I had no way of convincing anyone of what it takes faith to believe. The Word of God reveals that all faith, if it is genuine, must be tested. These Scriptures along with many others, teach us that God tests our faith through trials and suffering. Our suffering and trials also bond us together with our Lord Jesus in a special way, so we should rejoice in them, Peter wrote. The good news is, despite my long dark sojourn in the worst pit of my life (so far) ~ Jesus never failed to comfort me in my pain and agony. And I have every confidence that He will be with me no matter what nightmare I have yet to endure. God truly IS in control! For He has taught me through my trials and suffering, that as long as I have Jesus, though I might lose everything else, I have everything when I have Him. To have Jesus Christ is to have Heaven right here on earth. Though I may lose my health, possess no wealth, no prosperity, lose my ability to work, live in chronic pain day and night, my Jesus is still with me and He won’t ever leave me. He won’t give up on me. Though I may be able to do nothing for Him, He still loves me and He will go on loving me because He suffered and died on the cross to ransom me to become His very own. And when I suffer, I am sharing a bond with Him that I would never have known otherwise. Again, I can’t thank all who prayed for me enough. You will never know this side of eternity what you mean to me. May God bless you all with a thousand reminders of His immeasurable love for you, and meet your every need, in Jesus’ name, amen. Thank you, thank you, thank you again for your prayers!!! Here is the Music Video “Eye Has Not Seen” May the Lord use this song and video to bless and encourage you today! Original Music Video “Eye Has Not Seen” © ℗ 2018 SD Harden All rights reserved. All Glory to God. Angel Song © 2018 Suzanne Davis Harden All Rights Reserved. Scripture Painting © 2018 SD Harden All Glory To God. Original Music Video “Eye Has Not Seen” © ℗ 2018 SD Harden All rights reserved. All Glory to God. Scripture references: King James version Bible, New Living Translation © 2007 Tyndale House Foundation All Rights Reserved. But a rainbow’s at the end. Christ will not let go. And guide us by His truth. He keeps for every soul. To send His promised rainbow. © 2017 SD Harden (Prayer Poem) All rights reserved. Psalm 89:9 You rule the raging of the sea; when its waves rise, you still them. Matthew 10:29-31 What is the price of two sparrows—one copper coin? But not a single sparrow can fall to the ground without your Father knowing it. And the very hairs on your head are all numbered. So don’t be afraid; you are more valuable to God than a whole flock of sparrows. Heavenly Father, thank You for Your beautiful Rainbow Promise that extends to Your whole creation. May You be with all who are suffering through any type of storms in their life today; hold them firmly beneath Your everlasting arms, give them Your peace and the assurance that through the dark clouds there will be a glorious rainbow awaiting them. May they know that their storm will pass and that You will restore them, thank You, Lord, In Jesus name, amen. 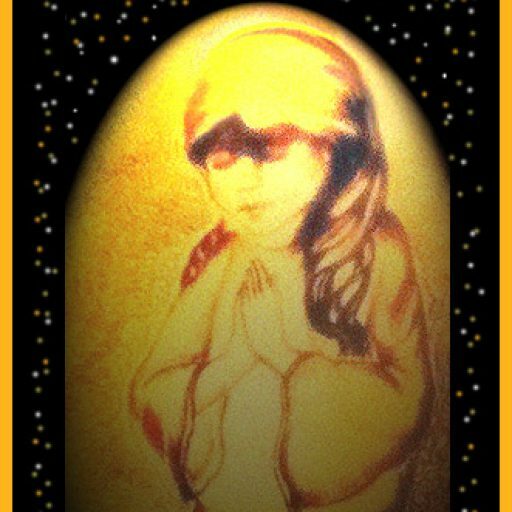 Angelsong Prayer Poem “God Keeps All His Promises” & Scripture Painting, & Piano Solo © 2017 Suzanne Davis Harden All Rights Reserved. Bible Quotations: King James Version Bible, English Standard Version (ESV) The Holy Bible, English Standard Version. ESV® Permanent Text Edition® (2016). Copyright © 2001 by Crossway Bibles, a publishing ministry of Good News Publishers. May our God be glorified throughout the earth! He’d none to leave behind. For he’d done nothing wrong. And come up holy, pure within. Plunged in a river all filled with sin. Clung to the Lamb of righteousness. On the cross when he was crucified. Up rose Jesus mighty to save! He rose from death, so we’d die no more. (Prayer Poem) © 2017 Suzanne Davis Harden All Rights Reserved. Matthew 3:4-6 Now John wore a garment of camel’s hair and a leather belt around his waist, and his food was locusts and wild honey. Then Jerusalem and all Judea and all the region about the Jordan were going out to him, and they were baptized by him in the river Jordan, confessing their sins. Matthew 3:11 “I baptize you with water for repentance, but he who is coming after me is mightier than I, whose sandals I am not worthy to carry. Isaiah 53:4-6 Yet it was our weaknesses he carried; it was our sorrows that weighed him down. And we thought his troubles were a punishment from God, a punishment for his own sins! But he was pierced for our rebellion, crushed for our sins. He was beaten so we could be whole. He was whipped so we could be healed. All of us, like sheep, have strayed away. We have left God’s paths to follow our own. Yet the Lord laid on him the sins of us all. John 11:25-26 Jesus told her, “I am the resurrection and the life. Anyone who believes in me will live, even after dying. Everyone who lives in me and believes in me will never ever die. Prayer Poem “Down To The Jordan Jesus Went” & Illustration © 2017 Suzanne Davis Harden All Rights Reserved. Scripture Quotations: NLT © Holy Bible, New Living Translation, copyright © 1996, 2004, 2015 by Tyndale House Foundation. Tyndale House Publishers All Rights Reserved./ The Holy Bible, English Standard Version. ESV® Permanent Text Edition® (2016). Copyright © 2001 by Crossway Bibles, a publishing ministry of Good News Publishers. Angelsong © 2017 All Rights Reserved. Several years ago I came down with a simple virus. I thought it would go away in a few days, for I had always been a very healthy person. But after a week my symptoms only grew more alarming and by the end of the month they became debilitating. I went from a healthy active person who walked 6 miles a day, to a person who could no longer walk, use my hands, or even see to read, write or draw, for my eye muscles would go into spasms if I tried to read anything. I had to stay still in a dark room and be quiet. This was unbearable to me for I had been so used to being active. As a working visual artist who drew almost constantly, being unable to use my hands was like being imprisoned in my body. I was terrified for I did not know if the illness was permanent, or even what the illness was. Nor did my doctors. They ran numerous tests on me for every horrible disease they could think of. I prayed constantly and confessed every sin I could think of –and then some, because I was certain I had done some terrible thing to make God mad at me for allowing me to become so ill and lose so many abilities. All I had ever wanted to do was glorify Him. Now all I could do was sit in silence before Him and weep. My head hurt constantly from migraines. I listened to audio bibles and sermons and this comforted me tremendously. During my time alone with the Lord, I grew very close to Him. There is nothing like suffering and affliction to draw you closer to God. He spoke to my heart. He promised to heal me. I clung to His promise. God’s word promises that “all things work together for good to those who love God” in Romans 8:28. I treasured all of the promises in His word trusting that all would be well, for God had never failed me. After many tests the doctors determined that I had Chronic Fatigue Syndrome and Fibromyalgia~ auto-immune illnesses caused by the Epstein Barre virus. It took 4 months of physical therapy before I could use my hands again to draw, paint, and write. After about a year I was able to walk almost a mile. midst of a dark, blinding storm. His glowing clothes are billowing all about Him as He presses forward with nothing and no one able to stop Him or His purpose for the little one He has charge over. His frightened little child is crouching close behind Him to escape the blast of the stormy tempest. The Lord is the child’s Shield, his Shelter, and Defender. The child clings to the Lord, as Christ leads Him through the Dark Valley of the Shadow; they are as one, they are so close together. This image truly reflects my experience with my Lord Jesus ~ He was my Good Shepherd throughout my illness and never once failed me through my crisis of fear, worry, doubt, anxiety, weakness, and pain. He led me all the way through that horrible storm and encouraged me with His word, His love, and His presence. I experienced the truth of that scripture through my affliction. And the painting is my expression of its truth. I had my painting printed and made into an Encouraging Card, which I sell in our Etsy Shop. The card is like a mini version of my painting. 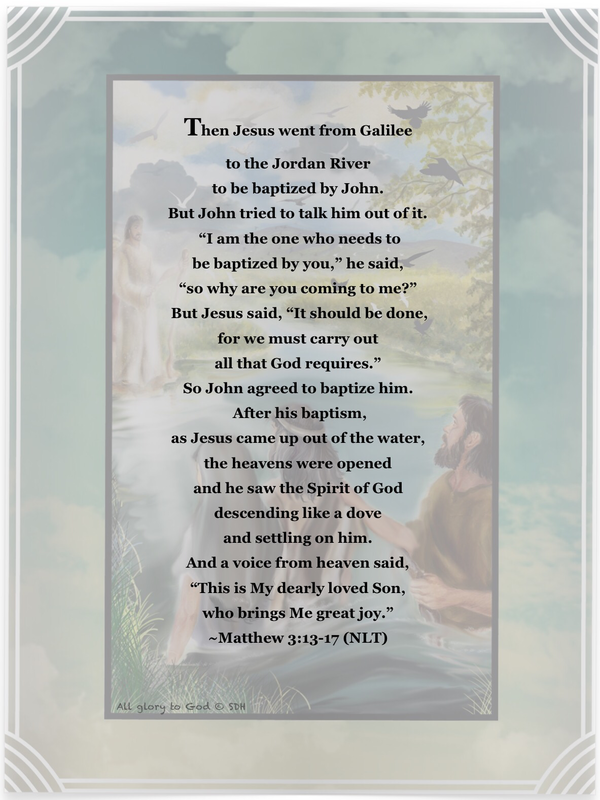 On the front of this card is the verse, “The Lord is my Shepherd…I will fear no evil, for You are with me.” Psalm 23:1,4 (Updated King James Version Bible) On the back of the card, Psalm 23 is printed along with a vignette of the cover illustration. This card has comforted many people through many trials. So I am thankful that the Lord allowed me to experience the terrible affliction that led me to be able to paint the picture. For I would never have been able to paint it had I not experienced the suffering, fear, comfort and faith all found in that image. Heavenly Father, thank You for sending Your Son Jesus Christ to be our Good Shepherd to guide us down the path of righteousness, truth, and grace that we might live with You in peace forever. We love You, In Jesus’ name we pray, amen. Heavenly Father, we praise and honor You, the most wondrous Father of all! May You bless all fathers today and fill their hearts with rivers of Thy love, peace, hope, and joy. May You grant them success in all that they put their hands to, prosperity, good health, wisdom, and guidance in all their ways. May You protect each one of them and all those they love from all evil, harm, sickness, and danger. Lord, please draw them ever closer to Thy holy heart and carve them more and more into the image of Thy Son Jesus Christ, whom You sacrificed on a cross of suffering and shame out of Thy great love for us all so that we might be Yours forever. May You help us all to understand what kind of measureless love You have toward us that would make You go to such lengths that You would allow Your one and only Son to be brutally murdered by those whom You created, to bear all of our sins, though He never sinned, to bear the hell we deserved, and then to forgive us when we seek Thy pardon and grant us eternal life with You. A human father who loves his children would sacrifice his life for them. Yet You sacrificed Thy child, for Thy creation. Thank You, Abba Father, for Thy indescribable gift; we love You, In Jesus holy name, amen.